Description: This image depicts a dorsal view of a female horse-fly, Tabanus stygius, which had been collected at White Pond, in Sudbury, Massachusetts. T. stygius are very large dark flies found in mid-summer, biting during the day. Their thorax is whitish, displaying several dark longitudinal lines, while their abdomen is black. They often attack both dogs and humans. This one, in particular, was feeding on the canine pictured in PHIL 15999, when it was captured. The Tabanus larvae are found in moist soil or ponds where they feed on small invertebrates. The adults are strong fliers and search out hosts from a distance. The painful bite they inflict is due to their mandibles, which are scissor-like and cut through the skin. The blood is then sponged up. Small hooks along the edge of the mandibles can help anchor the fly at the site of feeding, but also prevents the fly from a quick escape. This means if you can wait for just a few seconds before attempting to swat a feeding horse fly you will have better success at striking the target. T. stygius is a vector of equine infectious anemia also known as swamp fever. 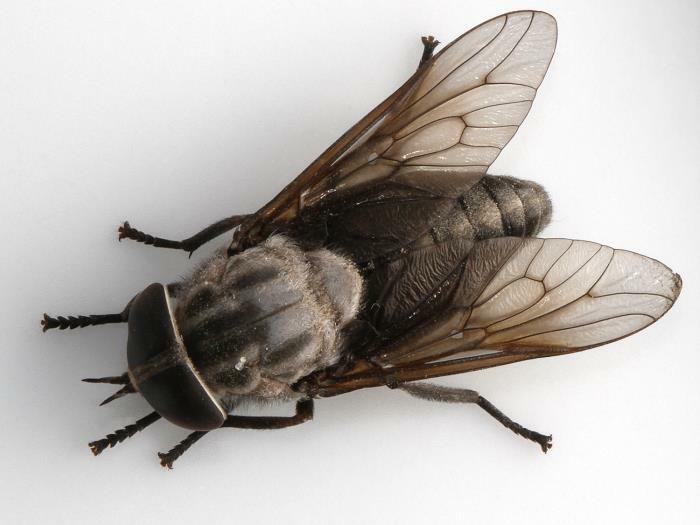 This horse disease is transmitted through the fly’s bite, and symptoms include fever, anemia, and even death. However, there is an equine vaccine available.